Sky Posse Palo Alto – Lets get equity in the Metroplex! Complain! Get Involved! Sign Petition! WASHINGTON, D.C—Today, Reps. Anna G. Eshoo (CA-18), Jackie Speier (CA-14), and Jimmy Panetta (CA-20) released an update provided by the Federal Aviation Administration’s (FAA) response to recommendations made by the San Francisco Airport/Community Roundtable and the Select Committee on South Bay Arrivals. The FAA’s update comes after Reps. Eshoo, Speier, and Panetta formally requested an update on the progress of the FAA Initiative to Address Noise Concerns of Santa Cruz/Santa Clara/San Mateo/San Francisco Counties. WASHINGTON, D.C—Today, Reps. Anna G. Eshoo (CA-18), Jackie Speier (CA-14), and Jimmy Panetta (CA-20) released the updated final version of the Federal Aviation Administration’s (FAA) response to recommendations made by the San Francisco Airport/Community Roundtable and the Select Committee on South Bay Arrivals. The updated FAA’s response includes Appendices that explain the FAA’s decision-making process and updates on recommendations that were previously under technical evaluation by the agency, as well as implementation timelines for those recommendations deemed feasible. Rep. Eshoo and Rep. Panetta, representing parts of Santa Clara and Santa Cruz Counties have followed up on the Select Committee’s recommendation for a permanent venue in the South Bay to address aircraft noise concerns for the currently unrepresented cities in their Congressional Districts. A copy of the Members’ letter co-authored with Rep. Ro Khanna (CA-17) can be viewed here. 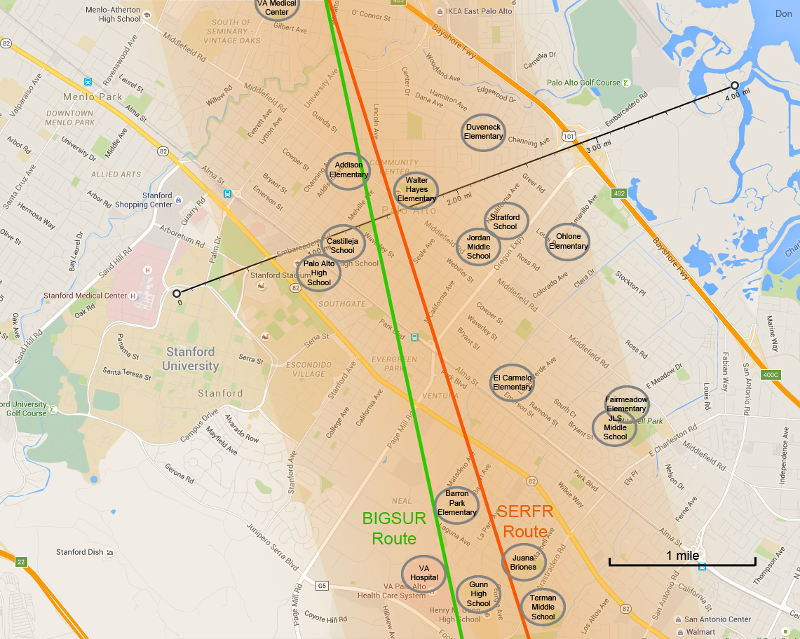 Three major routes into SFO intersect over Palo Alto. 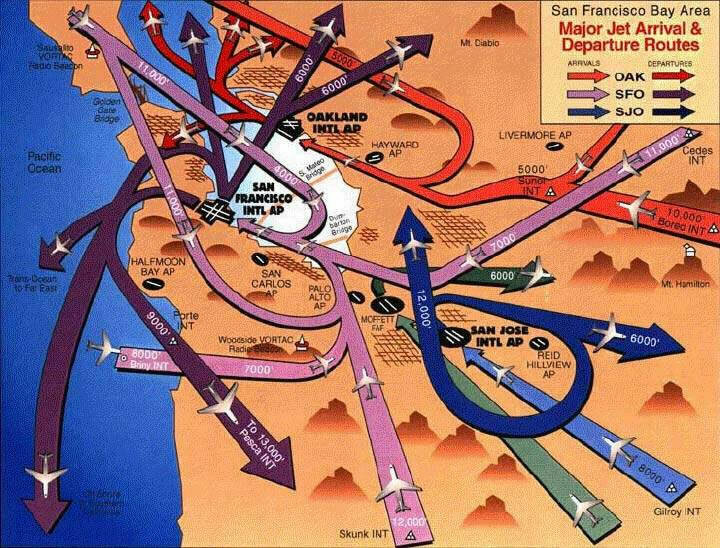 The FAA implemented NextGen, changed flight procedures, and moved vast quantities of jet traffic over Palo Alto. Traffic has been increasing at alarming and concentrated levels. Community outcry and congressional efforts resulted in FAA engagement via the Select Committee of South Bay Arrivals. full-size map and advocacy information. 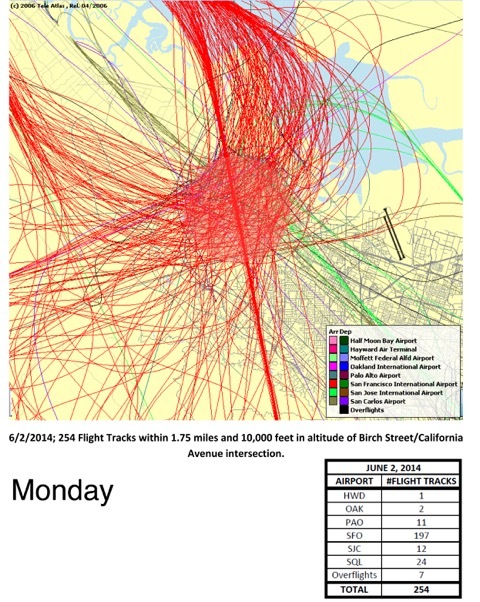 The number of flights over Palo Alto has more than doubled. The path has shifted slightly to the northeast. The proportion of flights near the bottom of the 4000-5000 foot altitude w indow has increased. The altitudes have a bimodal distribution. Sky Posse advocates for “Equitable Distribution” This is not equitable distribution. Flights from the north, south and west converge over a waypoint near the intersection of Willow Road and 101. They aim for an altitude of 4000 feet at MENLO and from there, take the final approach into SFO. James Sun analyzed traffic growth between 3K and 5K feet based on flight tracks received from the FAA. 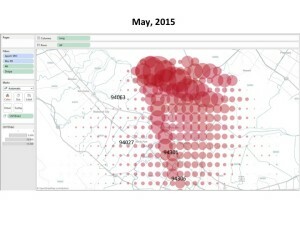 His analysis shows the number of flights from the south and southeast has grown substantially. Why? Traffic that used to fly other routes was moved over us. The charts below are based on flight tracks received in their entirety via a FAA Freedom of Information Act request. Certain jets flying over us emit a high-pitched whining noise that is particularly offensive to the human ear. They account for 17%-20% of the noisiest SF Peninsula over flights. Luckily, there is an inexpensive solution to this huge noise issue . 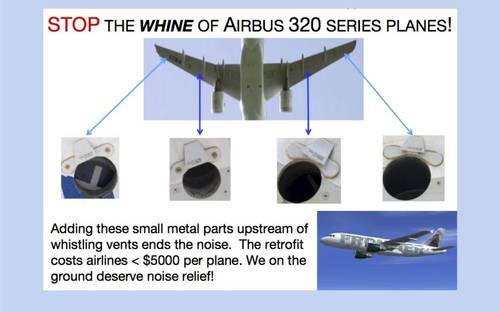 Sign the petition to ask the airlines to spend less than $5000 per jet to retrofit their fleets with simple air flow deflectors that STOP the horrible loud “whistling” sound affecting millions on the peninsula. On December 2, Representatives Eshoo, Farr and Speier sent to a letter to the FAA Administrator along with reports from the Select Committee on South Bay Arrivals and the SFO Airport/Community Roundtable. The three representatives: accepted the Select Committee’s and Roundtable’s recommendations; requested the FAA move towards implementation “as soon as possible; requested the FAA provide a progress update within 60 days. We recommend the FAA prioritize these two recommendations: assess one or more alternate waypoints for southern arrivals into SFO; address the problem of low-altitude night flights. The letter also cites the Committee’s recommendation that a successor organization be formed to be made up of local elected officials from the members’ three Congressional Districts. The Representatives state that they “will work with [their] incoming colleagues in the next Congress to determine how best to move forward with that recommendation.” Palo Alto – which experiences the highest number of overflights and is most impacted by SFO arrivals – should have a seat at the table. SKY POSSE PALO ALTO provides the information on this website “as is” and does not assume any liability for any errors or emissions, or for any misleading use of that information.